Looking for a cart that is not too big, but can carry all your things from your vehicle to the beach? The Wheeleez Mini Folding Beach cart might be the one you are looking for. It is the small version of the standard Wheeleez Folding Beach cart. This cart will make transporting your coolers, fishing rods, beach chairs and others from your vehicle to the beach easier. You might be wondering what makes this cart unique. If you check out the item the first thing you will notice is, its big wheels. Once the cart hits the sand you will notice how soft the wheels are and easy to maneuver. But it does not mean that it can carry only light items. 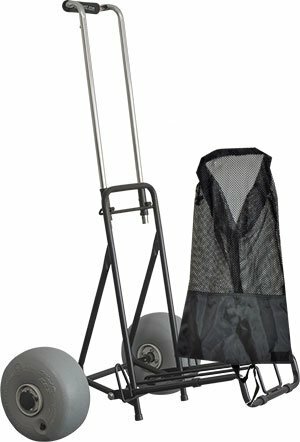 The wheels are very strong and are capable of carrying heavy load up to 99 pounds in any track without sinking or getting stuck. 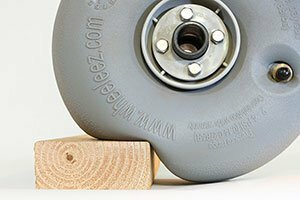 With regards to the visible specifications, the Wheeleez has 22 x 13.5 x 8 inches dimension and it weighs around 12 pounds. To accommodate your belongings it has an open space with wide base. The rubber straps tied around the frames are designed to hold the things firmly on the base. It has steel framework that makes the cart more durable than others. To provide the cart a classy look, it has an epoxy powder finish. It is considered as one of the best beach cart for sand because of its big smooth wheels. The latest 2016 model balloon wheels of Wheeleez mini folding cart are made from polyurethane which makes it great for kids as well. The handle height is 41 inches. It is made longer for ease of movement. It has tall mesh beach bag with drawstring closure. No space restriction because of its open design and straps are added into it. The handle is at right height. Simple and efficient rolling wheel. You cannot place small items into it because of its open space. The price is expensive in relation to the specifications and quality. If you are looking for something handy, but durable that will carry your things from your vehicle to the beach, the Wheeleez mini folding beach cart is the perfect product for you. It has a unique big wheels and a classy finish that makes it as one of best folding carts in the market today.